Clint from CrossFit Coronado left this one rolling around in my head like a BB in a coffee can, glad I got it out. Athletes pair up by ability level. Drew started the day SHREDDING his old DL PR by 30lbs! Then things really got going at 5am. Marianne relizes just how many more reps she has to do. After a PR Deadlift for both Ethan and Mac they split a 10 min Franny, a great end to a great day. 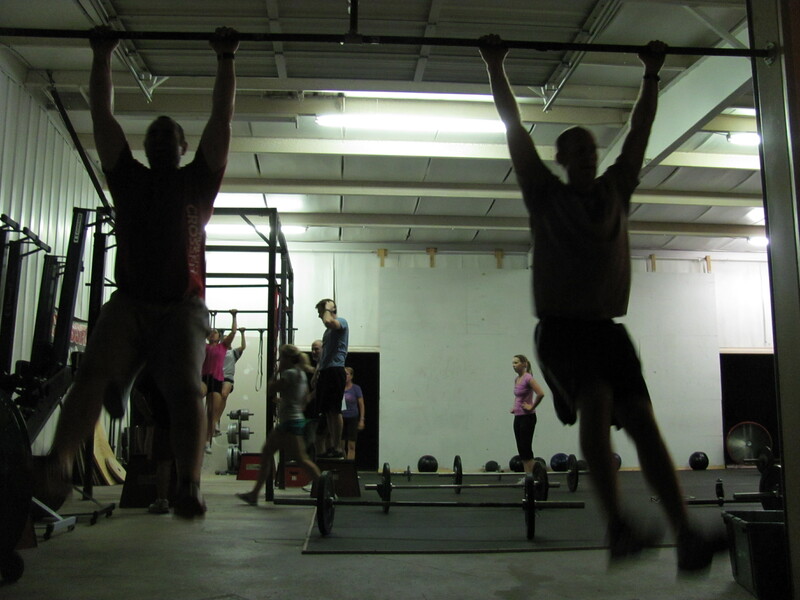 Today might have been my favorite Crossfit day, ever! 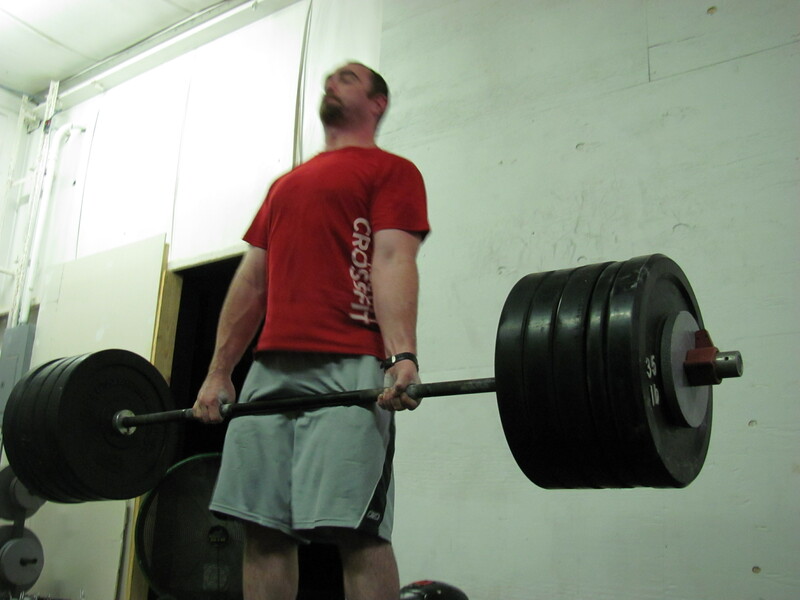 When Matt wrote Deadlift 1RM on the board I got really excited! Then he wrote F..R..A and I was jumping up and down! He then finished the word NNY and I was sad. But then just when my spirits were low he let me and Jonathan do Fran since we were absent last time! Congrats to all who had DL PRs today. Casey pulled an amazing PR but she will have to post it herself. I was so excited about what Matt posted that I decided to have two PRs today! For all of you (Brad) who thought I was sandbagging the DL you were right. Pulled 445lb. Not happy with my 6:07 Fran time but when I shed my summer weight I will move faster. Congrats on you time (faster than mine) Jonathan. I know its a long post but I am on an airplane. Outstanding Drew. Now that I know the SWOD I’m regretting doing Fridays workout yesterday at the hotel gym. Probably not conducive to a PR in the DL. DL: 165# a PR for me!!! Partnered up with Amy and time was 9:34. We’ve partnered up a few times now the last couple of weeks and she’s great!! Like Drew, I was pumped to get a makeup run at Fran. Thanks, Matt. Bumped my deadlift PR by 20 to 345#. Big weight by Drew deserves props! Fran at 5:27 was a new PR by about 1:15. Good morning at the box! DL pr 225 up from 215 last time. Felt really good. Great to have Ryan this morning and Claudia at 8:30, welcome. Do you know Ryan? The dentist? Are you talking about Amy’s husband, Ryan? Negative, Mr. Amy did not answer the bell! Three weeks into crossfit and I’m finally getting the hang of it. I’ve decided that the WOD is the one area in life where self-deception is a good thing. Told myself I did Fran at 65 lbs two weeks ago and did the same today. 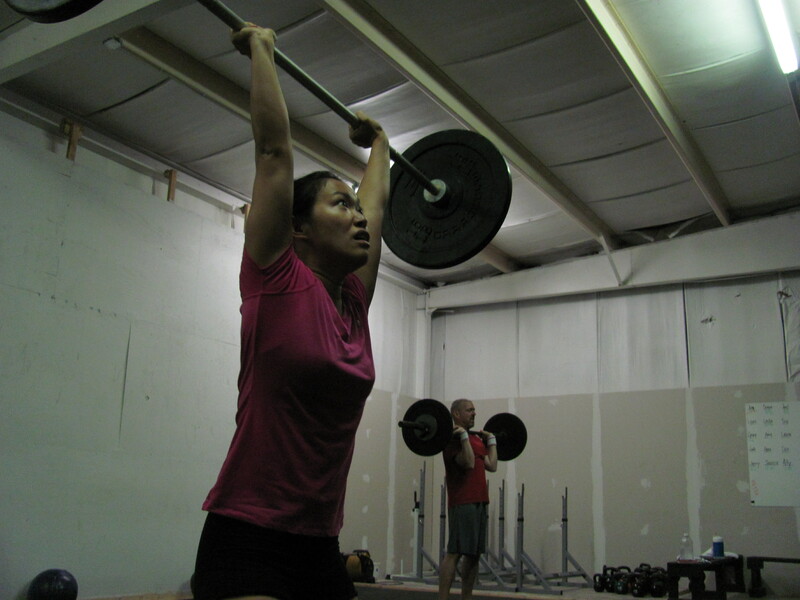 Looking back, I actually did Fran with the bar. Little mind over matter. Dan-I love that! Great job! Zach, any chance of a 4:30 class on Tuesday and Thursday? Yeah Zach, I want to come at 4:30 on Tuesdays, please. Also, just so you guys no I’m not mean, I didn’t have a partner today, it was me that was so slow…….I’ve been feeling bad all day for posting that. I loved being your partner, Sivi!!! Great job today! Zach, I’d come to a 4:30 class on Tuesdays!!!! 4:30 on Tuesdays would be awesome! Not a good day for me. Just didn’t have it. Sorry Val you did awesome and I could pull it together on the thrusters. DL was like 50 less than PR. Just wasn’t happening today. Time to get some rest. Did the WOD in 9:54 w/95# and Garrett as a partner. Could only pull 315 max today; 20# off my PR 🙂 Running kills my strength. Dang it – that should have been a 🙁 ! The 6:30 class was amazing today with a ton of new PR!! did WOD with Gary as a partner, we used 105# our time was 11:04 I think. Good job on the pull ups Gary. Awesome 630 turn out tonight! PR everywhere! Hit my Crossfit PR 385# DL and matched lifetime PR 405#!!! Wod time teamed with little Bro was 8:55. Killed me to finish but bro pushed me and we did it. Good job bro and to the rest of you that really pushed hard tonight!! New DL 1RM PR at 385lbs. 40lbs more than last PR. Confident I can break 405lbs next time. Good job Bear. Living up to your name. Fun WOD. Didn’t stop once on 21,15,9 kipping pullups. Interested to see how many I can do in a row without stopping. 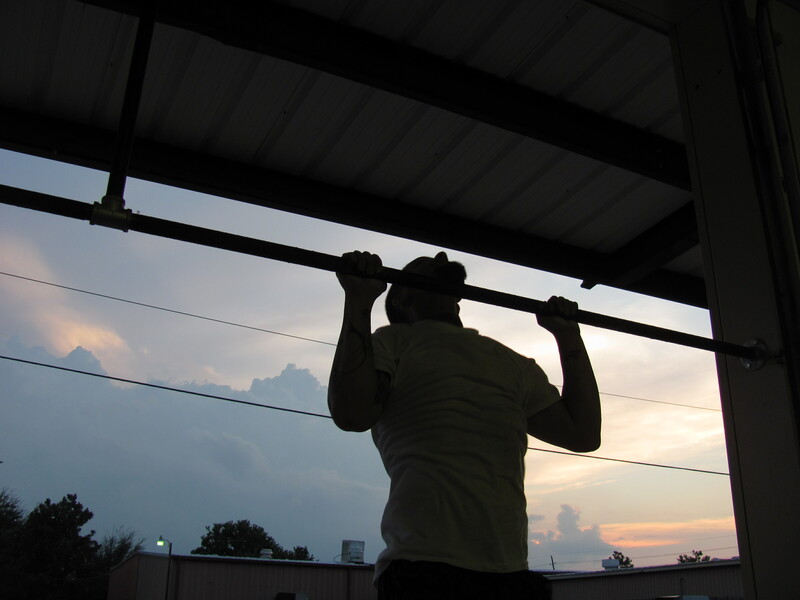 When I started this fanatical journey, I could only do one or two deadhangs, and “kips” was just a 1,000 lb-force I used in my structural engineering class in college. I chose mechanical engineering, and little did I know that those kips would come in handy one day.